It's CORNED BEEF HASH!! It's NOT "corned beef AND hash"! In this day and age when words are so important and people are so sensitive to almost everything WE say, why can't anyone take the advice they bestow upon on us and get it right, pay attention, and pull up their pants? It is important to note that HOMEMADE corned beef hash is not necessarily better than canned corned beef hash. This is probably unique ONLY to corned beef hash. Each has its advantages, but there are no disadvantages that we can even think about. So it must be true. "Homemade" is good because each version is unique in and of itself, yet retains that delectable corned beef hash flavor and texture. It's nearly impossible to mess that up. Although you would think the same about pizza but that ain't true. I mean, have you ever tried pizza anywhere in Colorado Springs? If not… DON'T! Trust us! It's unedible! Actually, have you ever eaten it anywhere outside New York or New Jersey? I mean, really!!?? How hard is it to get it right? It's THREE ingredients!!! Even in Hollywood they can't do it. Why? How hard is it? And don't even get us started on Chicago. Because they actually think their pizza is good. Trying to set themselves apart by adding more crust to it?? Ridiculous. Pffft. They want so bad to be New York. Anyways, where were we? Oh yeah. We need more coffee! Okay, now we must note that by "homemade" we don't suggest making it at home or eating it at home. (Unless you're a dame. Then you can make it at home) But we suggest eating at an eatery, a diner, or a coffee shop. Generally, they know the perfect amount of grease to add, you don't have to do the work, they refill your coffee non-stop and if you're fast enough you ain't gotta pay for it. Now comes "canned"! In the case of corned beef hash, canned is also always good. Yes, ALWAYS! And despite the brand, they all generally taste the same. PERFECT! So, why change that? You don't. If the place you eat at serves canned CBH, then embrace it. On a final note: the best solution to the "Do I eat canned or homemade corned beef hash?" dilemma is to eat it at a place that serves canned for breakfast, then homemade for lunch, or vice versa, and then continue that pattern indefinitely. Now where was that coffee we asked for? Now, you would think this would be self-explanatory, but it is not. Like drinking fine wine (more than $3.80 per bottle) there is a BEST way to eat corned beef hash. We've spent years perfecting the eating of corned beef hash and any variation on this method would lessen the experience. Trust us. We're professionals. 1. Eat it at the right place. As we mentioned before, find some kind of eatery, diner or coffee shop, preferably one that hasn't changed in forty or so years. You know the kind. The waitress can't hear cause she's some old dish long past her prime that squandered her youth and now steals cigarette butts from the ashcan during her lunch break. They generally serve the best. 2. GET AN EXTRA EGG. Usually they only serve two eggs. You need at least three. If not, you have more corned beef hash than eggs and that's like having more nachos than cheese. Like Gramma, it just don't work. 3. GET THE EGGS OVER EASY. 4. GET THE TOAST WELL DONE. This is especially needed in California where they do not know how to make toast. In NY, if you ask for toast they generally give you bread that has been toasted. JUST LIKE YOU ASKED. But in California, or at least the greater Los Angeles are (which actually isn't that great) they, for some reason, don't know how to toast bread. They run it through the toaster on light or something and it comes out slightly warm and a bit browner, but it cannot be, by most normal American standards, considered toasted. Anyway, toast up your toast perfectly, and demand it gets served WITH your breakfast (Los Angeles liberal waitresses also see no issue in delivering your toast either BEFORE you get your meal or, even worse, AFTER, when it is essential to the experience that you have your toast WITH your meal. Note: You CAN eat your toast with butter. Generally, WE don't put butter on the toast. It gets the toast soggy. However, you more experienced corned beef hash eaters can add butter to the toast. Eventually you can add butter AND jelly and still eat as described in section 6, but not even Schwartzy is up to that level. 5. EAT IT WITH COFFEE. Piping hot coffee. If it's late at night, or you are a bit of a fancy boy like our producer Jordan, you CAN drink decaf. Also, if you're gonna use milk, be warned. We know a guy that died drinking milk. (The cow fell on him). First, take a sip of coffee. Then place some corned beef hash on some potatoes, then place an egg on the corned beef hash, cut it up, place it all on the toast and bite. Enjoy. Swallow. FASTER!!! The faster you eat the better it digests and the more you can eat. Sip some coffee. And repeat. There's nothin' like leftovers in the morning. Well, at least that's what people tell us. We don't know for sure. We don't eat leftovers. We don't usually have any food left over. I know it is. I just said that. I know you just said that. I remember. Anyways, despite that, that's how corned beef hash was invented. It's even a delicacy in some countries. Like Hungary. Yes. I just said I was. Ms. Malone is writing all this down. We told her to. Don't worry about it. I'll cut this section out when I proofread this. You always say you're gonna but you never do. I will this time. I swear on my corned beef hash. Wow… really? Okay, sounds good. 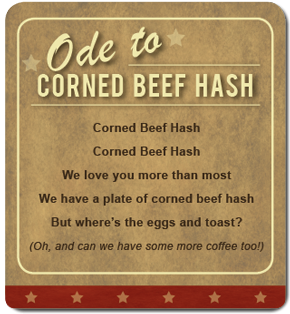 Yes, corned beef hash sounds good. Can we get back to it? Sure. Back to it… okay, where were we? Ah, yes! Corned beef hash. Anyway, the word "hash" is the French word for "to chop or slice." See, what they used to do back in the caveman day is chop up the meat and potatoes they had for dinner the night before. Wait a minute. The cavemen did that? Anyways, reheating leftovers was so obvious to the peasants that they didn't write down detailed recipes until 1861, which coincidentally is when Friedrich Wilhelm IV of Prussia dies and is succeeded by Wilhelm I. Why is that a coincidence? Because it didn't happen that way on purpose. Anyways, apparently Lincoln didn't finish his corned beef hash at his imagination dinner. Are you sure that's true? Pfff. Hatchet-faced nutmeg dealer. We gotta get one of those hats. Did his pop up like Fred Astaires?? So, getting back to it. Corned beef hash became especially popular in some countries during and after the World War that happened after the first World War, which happened to be the second World War. Coincidence? We have a lot of those. I know! Anyways, let the reader decide. The one who's reading this. You expect someone to read this? Now, "rationing" limited the availability of fresh meat, meaning there was a lack of all-you-can-eat buffets. For instance, in England, corned beef hash was served in tin cans and became the main food for the armed forces. And during the World Wars, canned corned beef was given to soldiers on the front, who nicknamed the meat "bully beef." And it is served with a fried egg, ketchup, winchestshire sauce, and pickled beet slices. They sound like a bunch of morons. Whereas in Scotland, it is called "stovies" and is served with roast beef. The Swedish, however, they serve corned beef hash with a raw egg yolk. What do you expect from a people who make you put together the furniture they sell. We'll cut that out too. So… ANYWAYS… there are many variations to this amazing dish. Most of them are nowhere near as good as what we eat here in our country. Also, did you know there is actually no corn in corned beef? I know YOU know, but I ain't asking you. Now, that's right. "Corned" was a term they used back in the day to describe salted meat. I can think of another name for salted meat. Did you know that pastrami is smoked corned beef? I didn't know corned beef smoked. In conclusion, corned beef hash came from people who could not finish their meals at dinner (not us) and could not think of anything else to cook for breakfast (we don't cook) than to chop up all the leftovers from the night before. Voila, the history of corned beef hash. You're WELCOME!!! © 2011, Cosmic Toast Studios.